Can you believe all of these dresses are under $100?? In fact, most of them are under $50 which is even more amazing. And they're all from one retailer. It's kind of amazing that so many fabulous dresses at such great prices could come from one retailer. They're from one of my go-to retailers that I shop at pretty regularly. I'm talking about Nordstrom Rack of course! 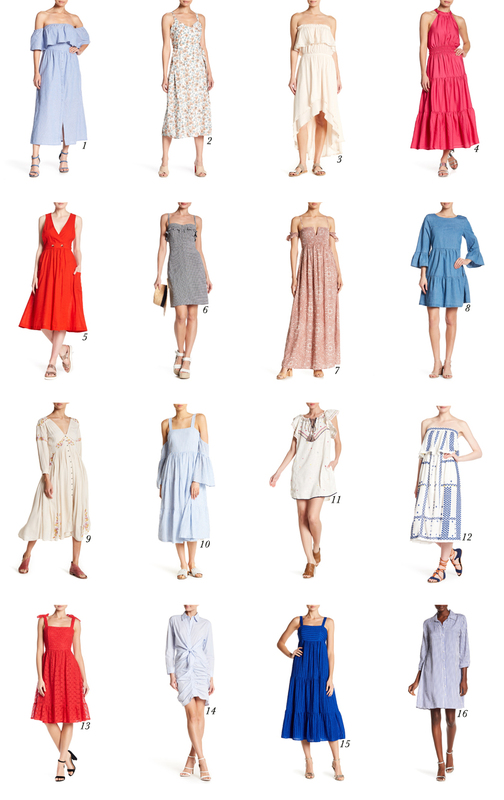 I'll be honest, I usually shop at Nordstrom Rack for shoes (they've got an incredible selection of shoes), but I was just perusing their site to check out their dress selection and I was BLOWN AWAY. So blown away that I had to create this post. There are just so many great dresses that I had to share the wealth. Okay, now which ones to get... What are you guys going to choose? These dress are so cute!! Can't help finding some for summer. Love the dresses you picked! My favorite is the 8th one, that color is what I'm looking for.